We know it is early but we’re doing the Elf, Reindeer and Mrs Claus schemes again this Christmas as they create lots of smiles, but we need YOUR help. Could you use your imagination, send a Christmas card or do a ‘shoe box’ of smiles? Plus we have a new scheme-Happy New Year Box. Reindeer scheme- A reindeer is someone who is assigned a family and sends 9 cards during the month of December, one from each reindeer, talking from the reindeers perspective i.e. the sleigh getting full, getting ready for the big night, loving carrots being left out etc. It is not only fun for the children receiving the cards, but also for the volunteers getting to do imaginative writing. In the past one girl believed the reindeer wrote to them as she helped look after her disabled brother. Another little boy was very relieved as Father Christmas definitely knew he was in hospital so wouldn’t be missed out. Mrs Claus- Volunteers are assigned a family and you send a letter from Mrs Claus. It can be a one off letter or a series, one volunteer even sent Santa’s favourite cookie recipe and the ingredients to make them. Elf scheme- Much like the shoe box schemes we are all familiar with, a volunteer is assigned a child and they put together a little box (it doesn’t have to be a shoebox) of gifts together and send it to the address on the child’s page. 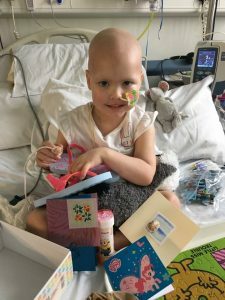 New Year- The Post Pals children often receive lots of cards during early December and then all post stops after Christmas until mid January. We would like to assign each child a volunteer to send a box of little gifts (under £15) either in the week following Christmas or beforehand but marking that the box is for the New Year. 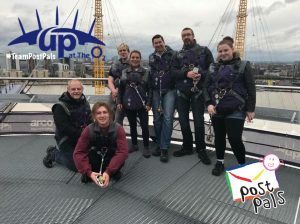 If you would like to volunteer please email Assignedprojects@postpals.co.uk and include which scheme you would like to volunteer for and any requirements i.e. a young girl. We have a particular problem finding volunteers for teenage boys. 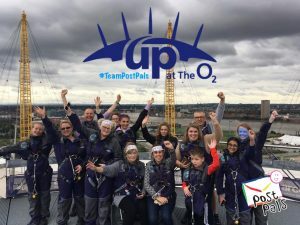 A huge well done to the 40 strong #TeamPostPals who climbed the O2 on Saturday the 7th of October and raised over £6000 towards our Chessington Appeal . 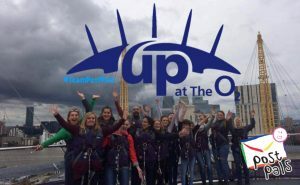 A special mention to Malachi for being the first ever blind person to climb the O2, Amina who climbed despite needing IV antibiotics minutes before the climb, Finlay and Libbi who were our youngest climbers, as well as Mae and Dan! Lots of climbers were scared of heights but over came their fear and had a great time! We are now looking to do another climb on Saturday 13th January 2018. The climbing experience can be under taken by anyone over the age of 9 and weighing under 21 stone, we had a few volunteers with disabilities who climbed slowly before.